Once your rigging is completed, you must group the puppet's skeleton to help organize the often large and complex networks. 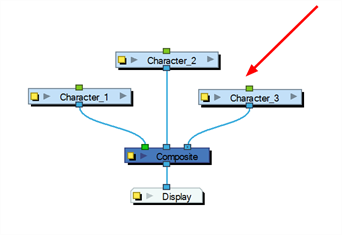 This way, once you have imported two or three characters into the scene, three Group nodes will be displayed instead of all the rigging connections of three puppets. In the Node view, select all your nodes. In the top menu, select Edit > Group > Group Selected Layers or press Ctrl + G (Windows/Linux) or ⌘ + G (macOS). Click on the Group node's right arrow to enter the group. If you do not have a Multi-Port Out node inside your group, in the Node Library view, select the Group category and select a Multi-Port Out node. Drag the Multi-Port-Out node to the Node view. Connect the Composite node's output port into the Multi-Port Out node. An output port is created on your Group node. In the bottom-left corner of the Node view, click Top to return to the network's root. You should now see an output port on your Group node. Click on the Group's Properties button to open the Layer Properties window. 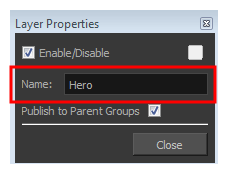 In the Layer Properties window, rename the Group node with your character's name.